Improving safety on our Nation's roadways is our number one priority and it's a shared priority as clearly demonstrated by the applications we received for this year's National Roadway Safety Awards. This biennial national awards program is the result of a long-standing partnership between the Federal Highway Administration and the Roadway Safety Foundation. It provides a national opportunity for our State, local, and agency colleagues to showcase and share their practices in roadway safety. The Federal Highway Administration and the Roadway Safety Foundation assembled a distinguished panel of roadway safety experts and advocates to review and judge this year's submissions. The panel was very impressed with the outstanding quality of all the applications and the commitment to safety that the applications demonstrate. We genuinely appreciate the time and effort each applicant spent preparing the application, but more importantly, for the work to improve safety that the application represents. 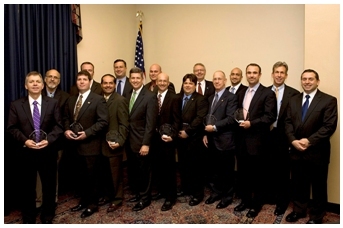 On November 15, the 2011 National Roadway Safety Awards were presented to the 11 winning applications. These awards are a formal recognition of the tremendous achievements our State, local, and agency colleagues have made in making our Nation's roadways safer. Each of the 11 winning projects advances innovation, effectiveness, and efficient use of available resources and are showcased in the 2011 National Roadway Safety Awards Noteworthy Practices Guide, available at http://safety.fhwa.dot.gov/roadwaysafetyawards/2011/npg_2011/. Congratulations to the 2011 National Roadway Safety Awards winners! On November 15, 2011, the Federal Highway Administration (FHWA and the Roadway Safety Foundation (RSF) formally recognized nine exemplary highway projects and programs from across the country as winners of the biennial National Roadway Safety Awards. Now in its eleventh year, the joint program honors agencies and organizations in the transportation community that have made verifiable and significant strides toward improving the safety of our Nation's highways through infrastructure improvements, operational improvements or program planning, development and evaluation. Every two years, this prestigious awards program examines the "best of the best" using effectiveness, innovation, and efficient use of resources as criteria for determining the winning projects. John Porcari, Deputy Secretary, U.S. Department of Transportation (far right) with the 2011 National Roadway Safety Awards recipients. "It is a privilege to formally recognize the localities and agencies that were selected for the 2011 National Roadway Safety Awards," said John Porcari, Deputy Secretary, U.S. Department of Transportation. "Each one of this year's entries demonstrated a commitment to saving lives by improving our Nation's roadways." "The best and brightest safety professionals who plan, engineer, and implement innovative solutions rarely get public recognition or the opportunity to know whose lives they have saved. These awards are an opportunity to thank those who increase our odds of getting home safely each day," said Gregg Cohen, Executive Director of the Roadway Safety Foundation. Each of the National Roadway Safety Award recipients was evaluated on innovation, effective-ness, and efficient use of resources. Project categories included infrastructure improvements; operational improvements; and program planning, development, and evaluation. For more information about these projects, please see the 2011 National Roadway Safety Awards Noteworthy Practices Guide, available at: http://safety.fhwa.dot.gov/roadwaysafetyawards/2011/npg_2011/. Using Micro Surfacing to Reduce Wet Weather Crash Rates. Having identified a series of bridges and approaches that had a higher crash rate than the surrounding highway due to a combination of a quickly freezing roadway surface and the fact that the bridges were on super-elevated curves over a railway, the Minnesota Department of Trans-portation (MnDOT) decided to apply a micro surfacing treatment to combat what was clearly a potentially dangerous driving environment during wet or icy weather. In a follow up analysis, MnDOT examined crash data for the 10 years both before and after the application to determine the effectiveness of the micro surfacing in reducing wet weather crash rates. MnDOT found that during the 20-year study period, wet-weather crashes decreased by 76 percent after applying micro surfacing. Total crashes during this time decreased by 19 percent, despite an overall traffic increase on the road of 65 percent. In looking at cost-effectiveness, MnDOT calculates that the resulting wet weather crash reduction has a payback ratio of 14:1 for every dollar spent when using a 5-year micro-surface reapplication schedule. If the time between reapplication is lengthened to 7 years, the payback ratio becomes 19.7:1. Mississippi Cable Median Barrier Safety Initiative. In the early 2000s, the Mississippi Department of Transportation (MDOT) launched a cable median barrier safety initiative to reduce fatalities and crash severity on segments of I-55 in northern Mississippi with particularly high median-crossover crash rates. The immediate reduction in crash severity led the State to expand its program, installing cable median barriers on a 12-mile stretch of interstate with such a significant history of high crash rates that the barrier was struck more than 20 times before construction was even complete. Since completion, however, there have been zero cross-median fatalities, and the crash severity has been dramatically reduced. Building on this success, MDOT opted to install an additional 6 miles of cable median barrier at another location plagued by median crossover crashes, further reducing severe crashes and fatalities on the interstate system. 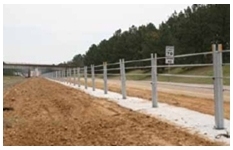 The State saw such significant safety improvements that MDOT awarded more than $20 million in cable median barrier contracts throughout the State in 2010, and another 150 miles of highway have been targeted for future cable-barrier implementation. Since the beginning of 2010, fully 209 miles of cable median barriers have been installed on stretches of Mississippi roadway with high crash rates. As funding allows, MDOT plans to continue its program to install cable median barrier as appropriate on all interstates and access-controlled highways in the State. Jones/Linn County Portland Cement Concrete Pavement Overlay with Safety EdgeSM. A study by Iowa State University found that a pavement edge drop-off may have been a contributing factor in approximately 18 percent of rural run-off-the-road crashes on paved roadways with unpaved shoulders in Iowa, and that pavement edge drop-off-related crashes were twice as likely to result in fatalities as other crash types on similar roadways. 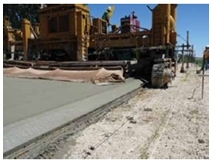 To combat this dangerous road safety issue, the county engineers of Jones and Linn Counties chose to incorporate the Safety EdgeSM on a 2.7 mile stretch of a county highway that carries an average traffic volume of approximately 1,350 AADT. The purpose of this project was twofold: first and most importantly, the counties hoped to improve the safety of a road segment that was on the list of Iowa's "High Risk Rural Roads" and second to evaluate the constructability, quality, and performance of the Safety EdgeSM. The project design included a 6-inch unbonded Portland cement concrete (PCC) overlay placed over an existing 6-inch PCC pavement. The overlay also included two 11-foot lanes with tied 2-foot shoulders plus a 9-inch wide, 30-degree sloped Safety EdgeSM in both eastbound and westbound directions. Crash reduction factors indicate that the use of the Safety EdgeSM has the potential to reduce crashes by 5.7 percent, making it a cost-effective countermeasure. Further, the Safety EdgeSM can also improve pavement edge stability, which may increase pavement life. Making Roadways Safe for Motorcyclists. Motorcycle safety continues to be a concern in Florida. In 2008, 532 motorcycle riders and their passengers were killed on Florida roadways, where motorcyclists account for only 6 percent of the motoring public but make up 17.8 percent of all fatalities. In 2009, however, those numbers dropped by 13 percent-to 402 fatalities, just 15.7 percent of all roadway fatalities-due to FDOT's outstanding efforts to create a motorcycle safety coalition, to develop a Motorcycle Strategic Safety Plan with 11 emphasis areas, and to create a plan that will track the initiative's implementation and status. The motorcycle safety coalition grew out of a request by FDOT to the National Highway Traffic Safety Administration to review the State's motorcycle programs and advise the agency on ways to improve motorcycle safety. One of the significant achievements of the coalition to date was producing a 10-minute training DVD that calls attention to common road conditions that challenge motorcycle riders. The video shows how motorcycle riders react to different roadway conditions including grates, potholes, ridges, steel plates, pavement markings, grooved surfaces, loose gravel, lane changes, and drop-offs in work zones. The video also enables viewers to understand more clearly how a motorcycle rider reacts when encountering these various roadway conditions. FDOT hopes that the problems identified in the DVD will be useful in training sessions for engineers and engineering groups throughout Florida. Evaluation of Moveable Barriers in Construction Work Zones. 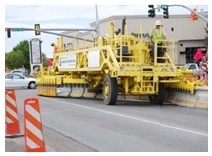 When UDOT discovered that a State road project to reconstruct and widen a 1.7-mile arterial had severe safety problems with a work zone area that was confined, inefficient, and lacking in positive protection for workers, the agency decided to act. In response to the situation, UDOT decided to use a moveable barrier system that would essentially create a "reversible" lane. The moveable barrier system consists of one-meter sections of jersey wall modified to have a "T" top, creating a lifting surface for the transfer machine, also called a "zipper machine." The barrier transfer machine lifts the barrier and passes it through an inverted conveyor system, laterally transferring the barrier from 4 to 18 feet in a single pass. For the Utah project, the machine moved the barrier multiple times daily based on peak traffic needs, but the transfer itself took only about 20 minutes to complete (including repositioning signage and traffic control devices). As one of the first applications in the country on a highly congested urban arterial, the moveable barrier positively separated workers and motorists; enabled a larger, more efficient work zone in the off-peak periods to help accelerate construction; and resulted in zero work zone encroachments by motorists into the work area. Safety Patrol Sponsor-Partnership. This award was given to Travelers Marketing LLC, a private company which identified a highly effective transportation program with untapped sponsorship value and forged partnerships with companies whose business interests and corporate missions aligned with the programs' safety objectives. Travelers Marketing's role is to identify the sponsorship elements, assemble the private partners, lead them through the procurement process, and implement and manage the sponsorship program throughout the term of agreement. The first Safety Patrol Sponsor-Partnership was developed in Massachusetts in 2002. Since then, six other States, including Florida, Pennsylvania, Georgia, New York, Maryland and Kansas, have joined the program. These partnerships are built among State departments of transportation and toll road authorities, the private-sector, sponsor companies, and Travelers Marketing. Through this sponsorship program, what was previously a significant DOT expense now generates in excess of $30 million for participating States over the term of the current partnerships. These funds are typically reinvested into new safety patrol vehicles, equipment, and drivers. Sponsorship revenues often enable States to sustain or expand safety patrol programs when they otherwise would not be able to do so. California's HSIP Application and Evaluation Tool for Local Roadways. Due to the sheer size of the State, local roadway safety improvement projects in California must be identified and scoped by the more than 600 individual local agencies that are eligible for Federal Highway Safety Improvement Program (HSIP) funding. Because these agencies' safety evaluation processes and staffing range from being well-established and fully staffed to having no evaluation capabilities and being unstaffed by safety professionals, Caltrans took the opportunity to advance its long-term goal of improving local road safety by creating a tool that would assist local agencies to select projects with the maximum safety benefit by making the local roadway HSIP entirely data driven. To do this, Caltrans' Division of Local Assistance (DLA) staff went into partnership with the University of California Berkeley's Safe Transportation Research and Education Center and with members of California's Strategic Highway Safety Planning team. The result is a user-friendly HSIP Tool that works within the context of the State's not always reliable local roadway safety data to make fair and consistent project selections that follow Federal guidelines for proven safety countermeasures. The tool also encourages local agencies to emphasize roadway safety through network analysis and low-cost safety projects. Smart Roadside Inspection Program. The challenge for Commercial Vehicle Enforcement (CVE) has been keeping up with the growth in commercial vehicles. There are more than 12 million registered commercial vehicles in North America today, and the number is growing. Traditional inspection is limited by a fixed number of CVE inspectors screening "unsafe looking" or randomly selected trucks. 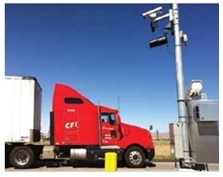 But New Mexico's Smart Roadside Inspection System Program is an electronic screening system that is based on objective testing criteria, which helps level the playing field. In addition, multiple roadside sensors allow automated data collection from passing vehicles without creating transportation slow-downs or stoppages. When the sensors identify a high-risk vehicle, it is checked against safety and security databases for alert flags for enforcement operations. Because this is done automatically, the Smart Roadside Inspection Program allows CVE personnel to focus their resources more efficiently and effectively on trucks that pose the most risk to transportation safety and security without interfering with the flow of commerce. The system also rewards responsible carriers with free-flowing travel and motivates those who do not maintain or insure their fleets to comply with the law more closely. Minnesota County Road Safety Plans. Minnesota's 2007 Strategic Highway Safety Plan noted more than half of the State's traffic fatalities occurred on local roads, but MnDOT realized that meeting the statewide Toward Zero Deaths goal would not be possible without reducing crashes on those systems. County highway departments in Minnesota, however, do not generally have experience with carrying out system-wide crash analyses or linking crash causes with mitigation strategies at specific locations. In response, MnDOT initiated the County Road Safety Plans (CRSP) Program to engage local highway agencies in the safety planning process more fully and to provide these agencies with the technical assistance needed to apply for State and Federal funding successfully. The CRSP process includes a crash analysis and system-wide risk assessment of road and traffic characteristics for each county. This process results in the identification of low-cost, infrastructure-based safety projects for specific at-risk locations on county roads. MnDOT then works with county engineers to prioritize projects and familiarize them with the safety project development and the Highway Safety Improvement Program solicitation processes. The first set of 20 county road safety plans completed identified $70 million worth of projects equating to $3.5 million per county. About 90 percent of these projects focused on roadway departure crashes. Program Planning, Development, and Evaluation. Wright County Minnesota is one of the fastest growing counties in the Nation and is responsible for 520 miles of highways. Because safety is a top priority for the Wright County Highway Department, the agency initiated a number of safety programs and strategies in order to minimize injuries and fatalities, particularly those resulting from roadway departure crashes and intersection crashes. Wright County has initiated several projects to combat this problem, including improved pavement markings and signage and ITS technologies such as intersection warning systems, a curve warning system, and driver feedback speed limit signs. These engineering safety improvement projects have contributed to a 34 percent reduction of fatal and serious injury crashes since 1997. Public awareness also has improved the effectiveness of Wright County's safety programs. Wright County has proactively engaged the local media and has been an active participant in the statewide Toward Zero Deaths Program Team and other safety organizations. As a result, a positive change in the safety culture has been created in Wright County. Texas Department of Transportation (TxDOT)- FM 1960 Median Improvements Program. FM 1960, the primary east-west thoroughfare in Harris County, TX, has a daily traffic count of approximately 65,000 vehicles, 50 cross streets, 36 signals, and a driveway density as high as 49 driveways per mile in a mixed-use area that includes commercial, retail, and residential developments and a high population density. Only two sections along the entire 8-mile corridor had raised medians. A 3-year study documented 2,171 crashes on the corridor, some 217 percent higher than the statewide average. Between 1998 and 2000 there were a total of 2,316 total crashes, with 42 percent occurring at intersections and 58 percent at driveways. On the 2 existing sections of roadway containing raised medians, however, there were only 123 crashes per mile - 17 percent fewer crashes than on those sections with a continuous center left-turn lane. In response, TxDOT initiated the FM 1960 Median Improvements Project to improve mobility and safety along approximately 8 miles of FM 1960. The project included construction of raised-curb medians, channelized left-turn bays, signal improvements, and striping. Although it is too early to have sufficient crash data to assess the results, modeling data in the FM 1960 Access Management Study indicates the improvements will reduce travel time by an average of 16 percent, delays by an average of 40 percent, and the number of stops by 45 percent. New Jersey Local Technical Assistance Program (NJ LTAP) - Work Zone Safety Education Program. Developed, maintained, and led by the NJ LTAP at Rutgers Center for Advanced Infrastructure and Transportation, the Work Zone Safety Education Program has a 20 year history of providing a multi-level, interactive, and state-certified collection of educational training courses. For the past 12 years, the program also has included a major statewide annual conference for State transportation agency officials, law enforcement, highway construction managers, work zone personnel, engineers, and highway contractors to help reduce work zone-related injuries and fatalities. The annual conference and training sessions are updated based on practitioner feedback to provide up-to-date educational materials to incoming students. Because of this, the Work Zone Education Program does not simply develop and offer training, it serves as a "watchdog" for work zone-related issues and continually advances the program in an effort to increase safety in and around work zone areas. As the only work zone curriculum recognized by the New Jersey DOT (NJDOT), the program offers specified instruction on an annual basis to more than 1,000 work zone safety professionals at convenient locations statewide with little or no cost to the attendee. To a degree, New Jersey credits the increased availability of training through the program to a 50 percent decrease in work zone worker fatalities since 2007, despite a concurrent increase in highway construction projects.